Good customer experiences correlate to retention loyalty, enrichment loyalty, and advocacy loyalty. That may be why according to a Forrester Wave report, 1/3 of enterprises are using SaaS CRM tools. But it takes several factors for CRM tools to be successful. 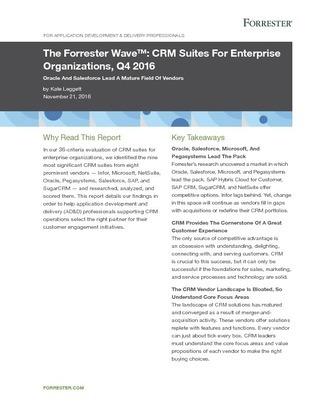 In this Forrester report, explore a 36-criteria evaluation of CRM suites to help you identify which tools may best fit your organization’s needs. Microsoft may use your contact information to provide updates and special offers about Dynamics and other Microsoft products and services. You can unsubscribe at any time. To learn more you can read the Privacy Statement.